Ian Parker - 21st century blues man Expressed through a distinctive bitter-sweet vocal delivery and harrowing guitar work, Ian's songs hold nothing back. His ability and willingness to share with his audience, naked honesty and genuine emotion, is what sets him apart. Drawing on an eclectic range of influences, this young man is fast becoming Britain's best loved blues/roots performer. A songwriter genuinely literate, sometimes almost literary, Ian is an original craftsman rooted in the blues but not trapped by any desire to replicate the past. Expressed through a distinctive bitter-sweet vocal delivery and harrowing guitar work, Ian's songs hold nothing back. His ability and willingness to share with his audience, naked honesty and genuine emotion, is what sets him apart. Drawing on an eclectic range of influences, this young man is fast becoming Britain's best loved blues/roots performer. A songwriter genuinely literate, sometimes almost literary, Ian is an original craftsman rooted in the blues but not trapped by any desire to replicate the past. He is without doubt a relevant contemporary blues man. Ian signed to Ruf Records following a personal introduction to US record producer, David Z (Prince - Purple Rain). His debut album 'INSIDE' (Ruf1094) was released in October 2003. In March 2004, Ian appeared on Germany's top live music TV show, 'Rockpalast' as part of the 'Crossroads Festival'. 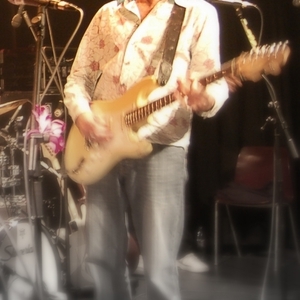 Ian and his band were voted the number one act of the festival and a live DVD of this incendiary performance was released in June 2005, entitled '?WHILST THE WIND' (Ruf3007). In addition to the DVD, a live album documenting Ian's performance in Hannover during his December 2004 European Tour, was also released in June 2005 under the same title (Ruf1102). Both releases met with high critical acclaim and continue to notch up impressive sales. In September 2005, Ian wrote and recorded five songs for a Ruf Records project album, 'PILGRIMAGE' (Ruf1112) which was recorded in Clarksdale, Mississippi and Memphis, Tennessee, and released in January 2006. The recording of Pilgrimage, not only extended Ian's touring activities throughout Europe and importantly into the US, it also had a profound effect on the artist's musical direction and focus. On return from America in September 2005, Ian began a lengthy artistic process based around his rediscovery of the blues and soul artists who had inspired him to begin playing as a teenager. This period of consolidation culminated in the recording of the album 'WHERE I BELONG' (Ruf1120), released in January 2007. 'WHERE I BELONG' was recorded in Cheltenham, England and produced by Matt Butler, whose extensive CV includes none other than Sir Paul McCartney. Recorded analogue to tape, the album has the rich and warm sonic characteristics associated with the pre-digital age, but there is nothing retro about this release. 'WHERE I BELONG' has something for all blues fans, purists and progressives alike. It catalogues the pronounced growth and self-discovery of a modern blues artist who is here to stay.